Join us this year for a variety of events. We hope to see you there! Celebrate Cinco de Mayo with some vino! Members, pick up your May wine club selection. Munch from a fabulous nacho bar with all the fixin's with a 'not so average wine tasting' ~ of an array of Dutton Estate Sangrias! We will make 5 different sangrias: Rosé of Pinot Noir, Sauvignon Blanc, Chardonnay, Pinot Noir and Syrah! Members, taste new releases and enjoy the day relaxing on the winery grounds. RSVP here to let us know you will be joining us. $10 per member (2 max) and $25 for additional guests. Summer Sippin' Though the Weekend! Slip into summer as we feature our favorite Summer Sippers and kick off the season for our Memorial Weekend Celebration. Blushing Sisters Rosé of Pinot Noir, Kylie's Cuvée Sauvignon Blanc, Kyndall's Reserve Chardonnay and Dutton Hard Apple Cider. Join us for a grilling competition between 16 wineries. Visit each winery for outstanding food and award-winning wines! Barbecue, wine and a good time at participating Taste Route 116 wineries. A flight of summer's finest wines - Rosé of Pinot Noir, Sauvignon Blanc, Chardonnay and Syrah. Each wine paired with our small summer bites. $30 per flight and includes small bites. Apple season is upon us and you will find our family in the vineyard and the orchards. 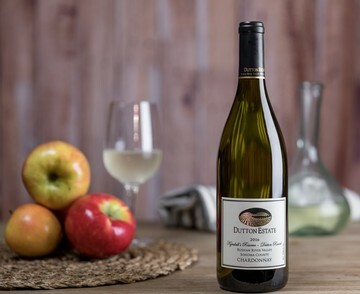 Celebrate apple harvest with us and enjoy our crisp, cold sparkling beverage - Dutton Estate Hard Apple Cider.